At a recent meeting of Toronto’s Public Works and Infrastructure Committee (PWIC), a motion was approved asking for reports on the comparative cost of streetcar and bus operations on Queen Street. The author of this was Councillor Michael Ford, although it was actually placed by his colleague, Councillor Holyday because Ford is not a member of PWIC. 1. City Council request the Toronto Transit Commission, upon completion of the construction projects that have resulted in the removal of the 501 Queen Streetcar route from service for Summer 2017, to defer reintroduction of streetcar service for a period of two weeks, to permit the collection of data for the comparison study. using bus data collected during the two week delayed streetcar re-implementation period, followed by the subsequent two weeks once they have been re-implemented, in order to get a clear and direct comparison during non-construction periods, and report back to the Public Works and Infrastructure Committee in the first quarter of 2018. The request received little debate coming as it did as an add-on motion to a Friday meeting. Nobody from the TTC was present, nor were there any interventions by downtown Councillors or members of the public. PWIC, although it deals with many issues affecting downtown, contains no members from that area thanks to the gerrymandering of committees by Mayor Tory. An amendment to this motion by Councillor Lee asked the Deputy City Manager to report to Council with additional information such as the cost and feasibility of such a study. The package passed on a 3-2 vote and the request goes to the July 2017 Council meeting for approval. My recent series of articles on bus vs streetcar operations on Queen was already “in the works” when this motion was approved, although this request triggered somewhat more urgency to producing them than I had planned. One important point flowing through these article is that “comparison” can be challenging when the underlying conditions vary. From the analysis I have published, it is already clear that buses tend to fare better than streetcars where traffic is light and demand is low, but they lose this advantage in busy areas. A further problem is that TTC operating practices for each vehicle type differ and buses tend to be driven more aggressively. Streetcars could be too, but in an attempt to manage service, various practices have resulted in streetcars being forced to drive more slowly than actual road conditions dictate. The longer this goes on, the more it is assumed to be an inherent part of streetcar operations, while those of us who have ridden the TTC for some years know what streetcars can actually do given the chance. The motion proposes that buses stay in operation for two weeks beyond the point that streetcars would have returned (Labour Day weekend) and that data be collected to compare operations. To be fair to the buses, this may not be an ideal period because early September sees much traffic displaced from King to Queen thanks to TIFF. Other planned construction work will disrupt the street: in September, track will be replaced at Queen & Coxwell, and in October/November at Queen & McCaul. Coxwell, at least, is well out of the core an work there will not affect streetcar service (a bus shuttle will run to Neville). There is also the question of whether the TTC will have enough buses to spare for Queen once the summer service cutbacks end in September. One issue raised by the motion and by some media reports is that riders feel they are getting a faster trip with buses. My analysis shows that for some times and parts of the route this is true, but not for the most congested areas. Moreover, as already noted, we are seeing buses unconstrained by a “go slow” operating policy compared with streetcars that limp along the route to avoid running early. This is not an apples-to-apples comparison. We have been down this road before when former Councillor Rob Ford, later Mayor, posed a series of questions to the TTC in 2010. My thanks to Councillor Kristyn Wong-Tam for providing the exchange. For the purposes of this article, I have divided up the material so that I can comment on each section, and reordered the sections to provide a better thread in the current context. It is no secret that I support the retention and expansion of the streetcar network. Although new suburban lines such as 5 Crosstown and 7 Finch West will use the “Metrolinx” Toronto car, whatever it might be, new lines in the waterfront west to Humber Bay and east to the Port Lands will be part of the “legacy” network. Waterfront plans depend on the capacity that an LRT link to Union Station can bring. The question of articulated buses as a streetcar replacement comes up from time to time. My response is that there are suburban routes where these are appropriate, but that in the congested core area, streetcars are the best vehicles for traffic conditions and they have the ability to operate underground where needed. Buses might be made to work, but only if Toronto is prepared to devote much more road space and time to transit vehicles. They are not a panacea for suburban motorists fighting their way through traffic in an oversized SUV. The proposal to redesign the central section of King Street with priority for transit and pedestrians moves into its approval phase with a report going to the TTC’s Board on June 15, and to the City’s Executive Committee on June 19, 2017. Details of the study behind this proposal are on the King Street Pilot page of the City of Toronto’s website. For those who have been following this project closely, there is little new in the report which consolidates material that has been evolving through a series of public meetings and consultations with affected groups along the route. No through traffic would be permitted, only local access, and vehicles would be forced to turn off of King Street rather than continuing in a straight line across the core area. Transit stops would be shifted to farside locations so that pedestrian activity from riders boarding and alighting would be separated from right turning traffic movements. No parking would be permitted, but specific locations would be designated as loading zones for short-term use and for taxi stands. In some areas, pedestrian space would extend into the curb lane, and would be protected with measures such as planters to prevent vehicle access. A generic view of this arrangement is shown below. The enforced turning pattern is summarized in the diagram below. The City expects that once motorists adjust to the new arrangement, the amount of traffic attempting to use King will drop and that these drivers will shift to parallel approach routes. Without this shift, the backlog of traffic awaiting turns off of King westbound at Jarvis and eastbound at Bathurst will present a substantial barrier to transit. This shift is easier for motorists to achieve east of downtown where parallel westbound routes are available via Front/Wellington, Richmond and Queen. To the west, options are much more limited because neither Front nor Adelaide runs west of Bathurst. This could affect congestion on Queen which is already a difficult corridor. Shifting traffic onto Richmond/Adelaide also begs the important question of redesign of those streets and the degree to which their designated lanes are already abused. These are cycling streets, and part of the grudging acceptance of the absence of bike lanes on King by some in the cycling community was the availability of parallel routes. If these are not both enforced and physically protected so that they remain available, conflicts between cyclist and cars will inevitably rise. Moreover, if these streets allow incursions by motorists into the cycling lanes, then the their true performance will not be measured because cars will have more capacity available in practice than in the design. Improved transit performance and capacity are obvious goals of any “priority” scheme. This raises important issues about TTC service that will be familiar to readers of this site. Speed alone does not provide more capacity for riders, it only moves them faster. Capacity is a combination of vehicle size and service frequency, and only by improving at least one of these will riders see a difference. If the TTC does not actually run more cars/hour and/or larger cars, then the capacity will not change. In this situation, the main benefit of the pilot will be to insulate transit from events that might disrupt service in the core area, and allow scheduled service to be better maintained. However, changes downtown will not have any effect on scheduled service in Parkdale and Liberty Village. Service reliability is important to riders because it makes their wait time for a streetcar predictable and distributes demand evenly among vehicles. The report states that congestion downtown “leads to unreliable streetcar headways along with bunching and gapping of streetcars”. This is true up to a point, but bunching and gapping are issues along the entire route including the spacing of vehicles leaving terminals. Indeed, the TTC’s own Service Standards accept a variation of ±50% from the scheduled headway so that cars intended to arrive every 4 minutes can actually show up on a pattern of 6-2-6-2-6 and be considered “on time”. The acceptance of bunching is baked in to the standards. In an attempt to fix one problem, the TTC created another. Indeed, if the pilot is successful in reducing travel times through the core, streetcar operators may have even more excess time and may be forced to dawdle even more simply to avoid running early. The fundamental issue here is whether there is a way to move major routes like King to headway-based management rather than schedule-based. This brings problems of crewing because vehicles would not be in “scheduled” locations. On the subway, the TTC deals with this by making crew changes between trains along the route to put operators back on time even though the trains are in the “wrong” place. This practice is much trickier for on street routes, and it is simpler to short turn both the vehicle and the operator. Although the TTC plans to provide more supervision of King Street service, this could be counter-productive if “staying on time” includes slowing vehicles down to match the existing schedules. To add to this problem, the lead time for a schedule change is close to three months, not the sort of nimble response one would want in response to changing conditions with the pilot. Because this is a pilot project, an important issue will be that as problems arise they are identified and fixed (or at least an alternate strategy tried) quickly. To that end, the report proposes that the process for changing the traffic rules on King and many adjacent streets be delegated to the City’s General Manager of Transportation Services. Normally, any traffic regulation change goes through a process of staff reporting to the local Community Council (in this case the one for Toronto & East York) and because these are transit streets, the report must then be approved by Council. For the pilot, a quicker process giving the GM the ability to make changes “on the fly” will be in place until December 2018. The full list of proposed changes to regulations on turns and parking is included in an appendix to the report. The City and TTC plan to monitor the project to see just what happens both with the quality of transit service and with the effects on traffic flows in the study area. One important aspect of any review will be to look not just at “ordinary” days, but at the effect of special events such as nearby road closures (e.g. events at City Hall and other central locations, parades and construction). Also of interest will be the behaviour of traffic in the entertainment district between Simcoe and Bathurst, especially west of Spadina which is very congested on weekend evenings. A plan that works on Mondays will behave very differently on Fridays and Saturdays. This pilot is a big change from the more timid approach to traffic management we usually see in Toronto. There is only so much to be achieved by tweaking traffic signal timings and adjusting regulated hours for parking and left turns. At some point, the more fundamental discussion – who is the road space for – must come forward. In this section of my review of bus and streetcar operations on Queen Street, I turn to a comparison of operating speeds by each type of vehicle over the route. 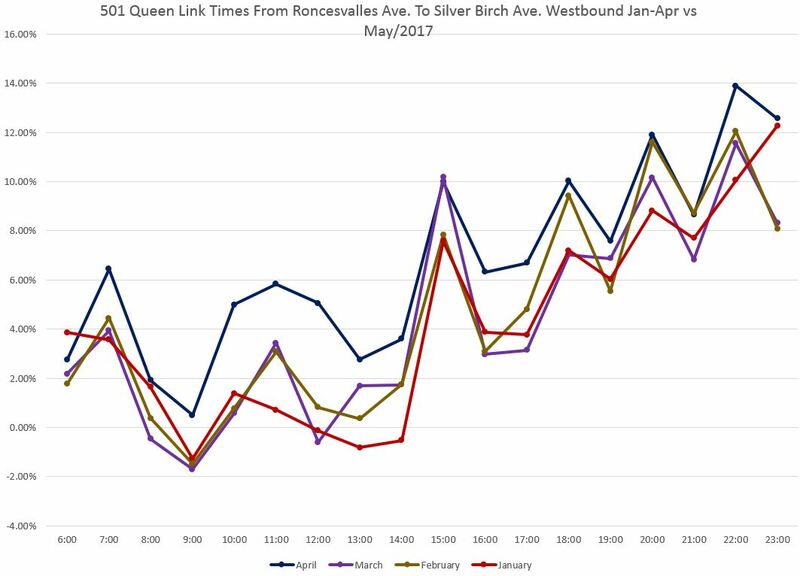 The charts presented here show operating speeds for the first week of May 2017 (streetcar) and the second week (bus) between Neville Loop and Roncesvalles. By way of introduction, here is one page from a set of charts. On this chart, streetcar data are plotted in orange and bus data in blue. The streetcar data are “on top” so that bus data peek out from behind showing the peaks where buses are operating faster than streetcars. Each chart set has many pages, one for each hour of the day from 6:00 am to midnight. The values plotted give the average of vehicle speeds along the route. The example above shows vehicles westbound on Queen during the PM peak hour of 5:00 to 6:00 pm. The chart should be read from left-to-right, the direction of travel. (Charts for eastbound operations have the same layout, but should be read from right-to-left.) The sawtooth form of the chart arises from locations where vehicles stop and the spaces in between where they are in motion. Approaching a stop, especially one where there is a backlog of traffic from the stop, there will be a gradual decline in speed, but then a fast pickup afterward as the vehicles move off. Locations with serious congestion and queueing will show up as an extended area of low speed corresponding to vehicles creeping forward to the stop. The evolution of traffic speeds over the day can be reviewed as an animation by stepping back and forth through the pages. This shows both the rise and fall of speeds hour-by-hour and the change in the degree to which buses operate faster than streetcars in some locations. 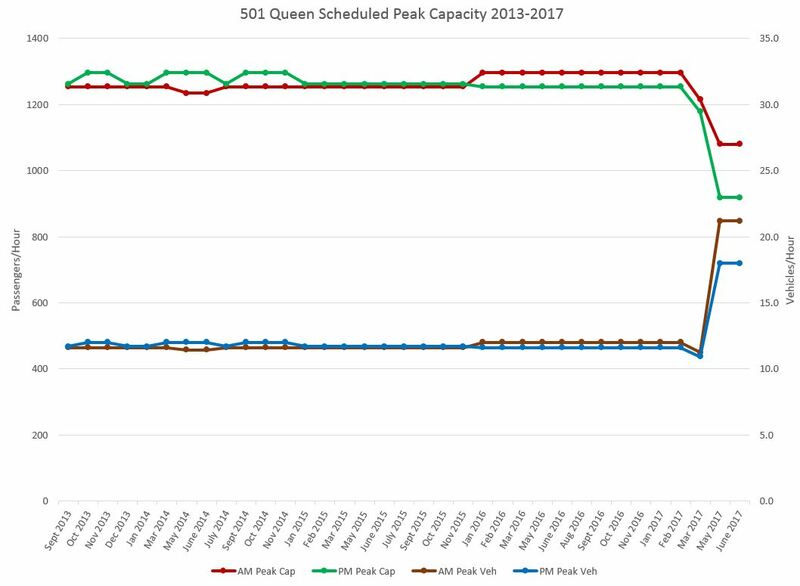 Updated June 17, 2017 at 7:30 pm: A new set of charts has been added at the end of this article to display the service capacity actually operated at various points and times on Queen in a manner that more clearly slows what is going on. The original charts have been left for reference. This article continues the comparison of bus and streetcar operations on 501 Queen by reviewing the capacity of service actually provided on the route. The chart below shows the hourly scheduled capacity of the route for its basic service in the central part of the route. This does not include the contribution of any trippers, only the regular service passing Yonge Street in each direction. For all but the last two entries (May and June 2017) service is scheduled to be provided by ALRVs which have a design capacity for planning purposes of 108. For the last two months, service is provided by buses with a design capacity of 51. There are minor variations from fall 2013 to February 2017 that are mainly caused by schedule changes related to whether or not the route operates as one continuous Neville to Long Branch line, or if it is broken at Humber. For the through service, headways are slightly different because of the need to blend service on the two branches. In March 2017, running time was added to the route to accommodate a construction diversion that was not actually implemented. This was done only by stretching the headway, not by adding cars to the route thanks to the overall shortage of streetcars. The result was a drop in both the cars/hour value and the scheduled capacity. In May 2017, streetcars were replaced by buses, but thanks to the shortage of buses, the capacity of the scheduled service was well below the level that streetcars had been providing. Although there were many more vehicles/hour, their much lower capacity meant that the scheduled capacity was below that of the streetcar service (especially when February 2017 or earlier is used as a base). The reduction was 17% in the AM peak and 27% in the PM peak, and this on a route that (a) the TTC knows is running over capacity and (b) has not had a service increase for many years thanks to the shortage of streetcars. Providing equal capacity would require that buses operate more frequently than they are now scheduled to do. This type of scheduling has been used in many places across the TTC system where requirements for extra running time have been achieved by running vehicles less frequently. This article continues a topic begun with Part I regarding the replacement of streetcars by buses over the entire Queen route due to several construction projects affecting the route this summer. 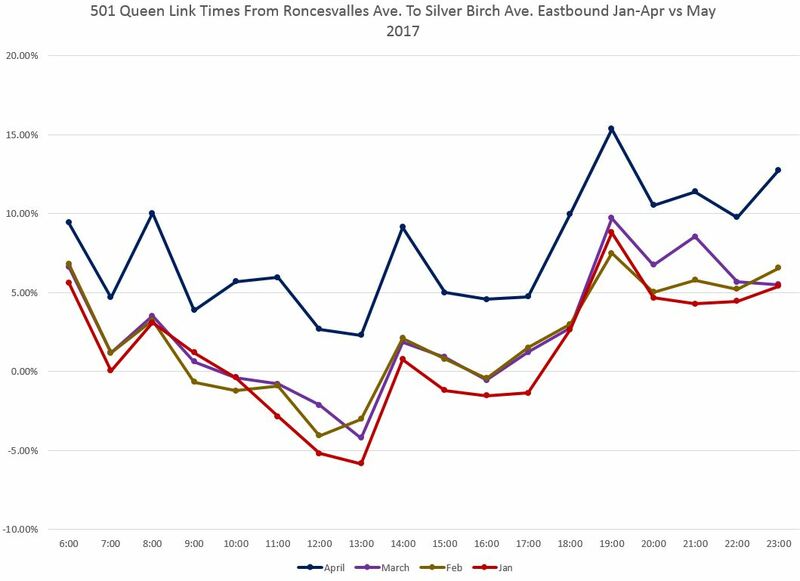 In the first article I reviewed vehicle tracking data for April 2017 when Queen was operating with streetcars between Neville Loop and Roncesvalles with data for May 7-31 after the route had been converted to buses. This look at month-long averages gives an initial impression that buses are faster under certain circumstances (period of lighter load and less traffic congestion), but this prompted me to look at other data to see if the pattern was consistent. What quickly appeared was that April 2017 was an unusually bad month for the route, and so average travel times in some areas were pushed above what is seen in other periods. 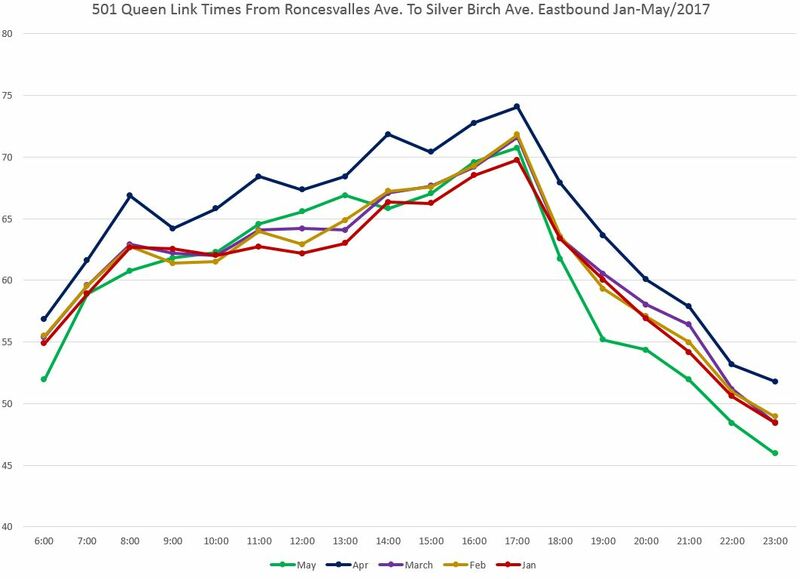 This article explores a more detailed look at historical travel time patterns on Queen. Apologies to readers who only want the highlights. I have included many charts in this post because some of you like a lot of detail and the ability to “look under the covers”. An important consideration here is that there is a great deal of variability in conditions on any route, and averages do not tell the full story. The summer 2017 conversion of the entire 501 Queen streetcar route to bus operation presents an opportunity to compare the behaviour of the two modes on this route. Apologies to readers in advance for the length and number of charts, but that’s the nature of the subject. The raw data for this article comes from the TTC’s vehicle tracking system, CIS, for which much thanks, but the processing and interpretation are entirely my own. The machinery behind the digestion and presentation of TTC data is explained in Methodology for Analysis of TTC’s Vehicle Tracking Data. April 1-30, 2017: At this time, 501 Queen service consisted of two overlapping routes. 501 streetcars operated from Neville Loop to Roncesvalles, while 501L buses operated from Dufferin to Long Branch. A local shuttle, the 501M, provided service on Marine Drive in the Humber Bay area, but it is not part of this analysis. May 7-31, 2017: All service on the 501 operated with buses on two branches. 501L buses ran between Neville and Long Branch Loops, while 501P buses ran between Neville and Park Lawn Loops. Buses alternated between the two branches so that, in theory, there would be a 501P half way in between every 501L east of Windermere and The Queensway where the routes diverged. Many readers will be familiar with charts on this showing the distribution of monthly headways (time between vehicles) and link times (time required to travel between two points). In addition to the detailed data, these charts include summaries of values by hour including averages and standard deviations. The latter values indicate the degree to which actual values differ from the average, and the higher the SD value, the worse the dispersion of individual values. This translates to “bunching” of vehicles which, in the worst case, sees buses running in pairs and trios. For the purpose of this article, I have created charts pulling together the statistics for streetcar (April) and bus (May) operation. In the case of May, only data from the 7th onward when the route had been converted are included. Are These Data “Typical” and “Representative”? In the process of working through the data, I became concerned at the gap between bus and streetcar times. In order to verify whether the April 2017 streetcar values were typical, I also pulled the values for January through March and found that travel times were generally lower for streetcars, although there remain periods (notably evenings) when the bus times over the route are shorter than the streetcar times. However, the difference is not as great as the April 2017 streetcar data implies. 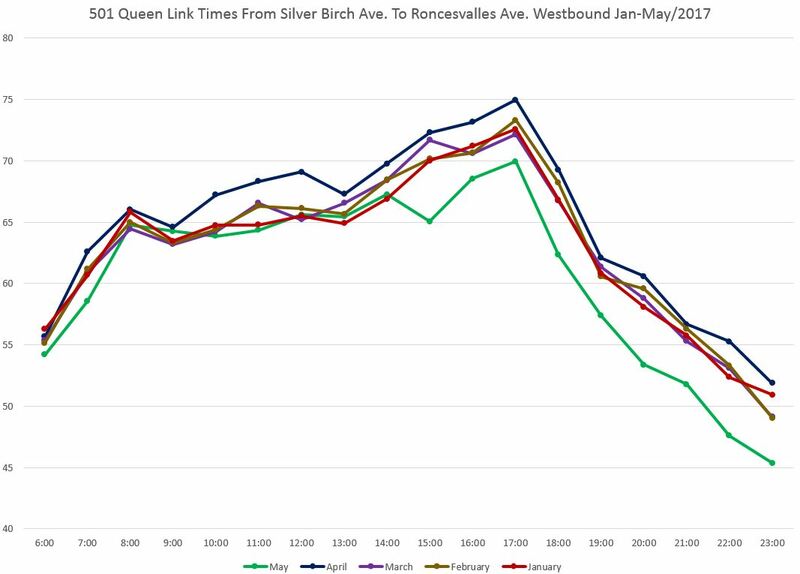 The chart below shows the travel time from Roncesvalles to Silver Birch by month from January to May. (Silver Birch is used as the origin rather than Neville Park because vehicle layovers at the end of the route sometimes occur west of that street, and measurements from that point could include layovers.) May data is bus only, and the other months are streetcar. This chart shows clearly that April (blue) was an unusual month, and streetcar travel times are higher than for previous months. 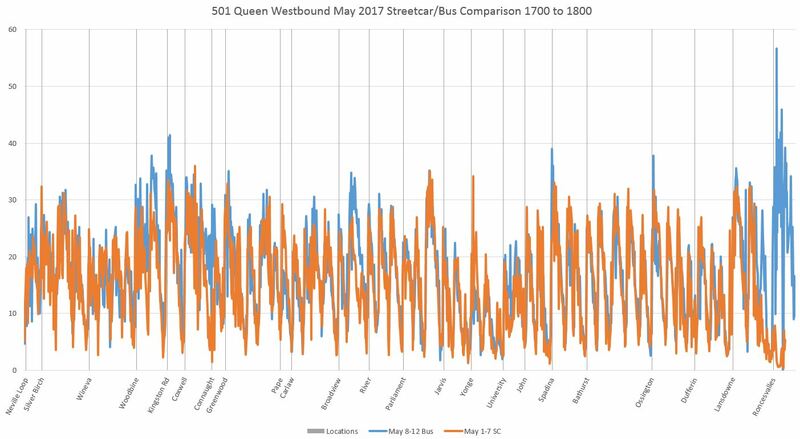 The May (green) data is for buses which are slightly faster in the evenings, but which lie in the same travel time range as streetcars for the months of 1Q17. The same data can also be shown as a percentage difference relative to the May (bus) data. Where the values fall below the 0.00% line, the streetcars are faster. As we will see in the detailed charts for April and May below, the advantage varies over the route and by time of day. The differences westbound are not as striking, but they are still an improvement over the April-to-May comparison. The moral of the story here is that a data comparison may not be what it seems, and a few weeks’ data are not necessarily representative. For example, if the first part of September were used as a reference, this would be during the traffic mess downtown brought on by TIFF and especially the 504 King diversion. This would not be representative for either mode. Similarly, the situation under poor weather may not produce the same comparison as under the generally fair weather experienced in May, the base month for the bus comparison here.